I interviewed Dolvett Quince last year for JET, and we talked mostly about the Biggest Loser, which was prepping to air its season finale at the time. This is a quick left over that didn’t make the interview where he shared his favorite fat-burning workouts, and answered the popular quandary about whether we should eat before or after working out. I’m a huge advocate for body confusion. I feel like if I do a comination of strength training and cardio in my workouts I’m gonna maximize the benefits to my body. A lot of female clients that I’ve trained in the past are geared tward cardio and wanna train this way. The guys that I’ve trained in the past tend to want to just strength train. The benefits of both sides is to do a combination of both. It depends on the person. It might be trial and error but listen to your body. I prefer to eat after a workout but sometimes my body needs it beforehand so it varies. How about you? Scroll back up and ogle admire his physique to ensure your good day. Micaela Mamede is the woman responsible for taking this photo of me on the “about” section of Grunts and Glam. We met in 2012 at Flight Club’s Sultry Summer Showcase and have kept in touch ever since. She immediately struck me as a creative warm spirit, which turned out to be true. 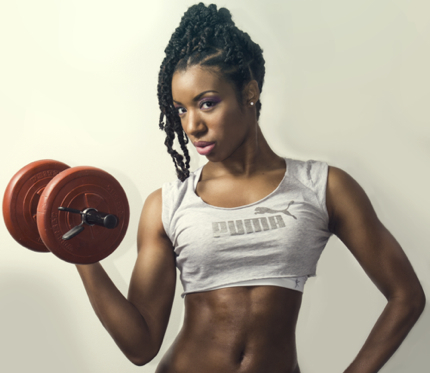 She has danced for most of her life, and currently makes a living as a fitness renaissance woman. I’ve taken some of her pole dancing classes at New York Pole Dancing but she also teaches yoga, ballet barre and a lot more. Her down-to-Earth but also tough demeanor (in other words, you’ll get results with her), is why she has a large following of loyal students. I caught up with her to chat about her fit life full of empowerment and gratitude. You’re a fitness renaissance woman so help me keep up. What are your teaching specialties and how did you transition from life as a dancer to a fitness instructor? Thank you for such a big compliment! Pole Fitness is my bread and butter and what I’m most experienced in, but I also teach vinyasa yoga, Unnata Aerial Yoga, Fly Gym, ballet barre, chair dance, endurance, flexibility training and am currently becoming certified to teach Pilates. I have always enjoyed coordinated movement in all its forms, either it be therapeutic, entertaining or athletic. I started dancing when I was 5-years-old–first, ballet, later, Latin rhythms, amongst others. Almost three years ago I “landed” at New York Pole Dancing due to a need to keep dancing, but pole is so much more. I decided to explore and become more educated in my craft: movement. Fitness is just a consequence! What are some of your favorite things about teaching classes? Without a doubt, student interaction and student empowerment. There is nothing more gratifying than seeing how comfortable students get in my classes and catching them daydreaming while dancing to my routines. Or to see the bliss in a student’s face after a yoga class. I believe movement heals, not only physically, but emotionally. To be able to provide an hour of “escape” to hundreds of people on a weekly basis is priceless. 1) If you don’t recognize it as an ingredient from nature, chances are it’s a chemical, thus, don’t ingest it. 2) Everything in moderation, from pasta to meat, dairy to (natural) desserts, but use and abuse fruits and veggies. 3) Organic, organic, organic everything, seasonal and locally grown products. 4) Cook more. There are so many resources online for quick, healthy and delicious foods. The time it takes to order in and wait for your food, is the same time it takes for you to whip up a delicious salad, or sear some tuna. 5) Don’t think too much about it and RELAX! Exercise, eat as healthy as your knowledge allows, drink lots of water and be happy with yourself, both body and mind. What are your favorite methods of fitness and why? Ballet is my passion, I can just tune out and be that student daydreaming in class. Pole fitness is my motivation, my challenge and my ambition. It makes me a better mover in general, strong, flexible and agile. Yoga and Pilates are my rescue, my grounding forces. 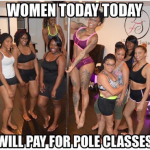 Different things on different days, although I must say, if your goal is to loose weight and tone up rapidly, nothing compares to pole fitness. There’s a spirit of generosity and gratitude in you fitness work, where you teach yoga to inmates and do fitness work in the community. Why is it important for you to share that with people? Thank you again for the compliment, but especially for noticing. I live from the heart, and it seems to transpire through my work. Without getting “too deep,” my belief system stems from ethics, compassion and the notion that we must cooperate and work together. I carry this notion with me at all times. Talk about your most recent fitness related victory, whether it’s a new pole move, more flexibility, etc, and how did you get to that place? Any advice for people who are newly embarking on a fitness journey? Do it because it makes you feel good somehow, whether it be because you enjoy movement or because your fitness choices will lead you to a healthier lifestyle. Don’t EVER embark on any journey, fitness or other, because someone, or society, has pushed you to it. Do it for yourself and cherish the ride! This has nothing to do with fitness, but what is the story behind that beautiful tattoo on your leg? I’m going to write your compliments on flashcards, and when the going gets tough, I’ll pull one out and smile! Thank you, again! The pink satin ribbons we use in ballet shoes, because ballet has been a part of my life for such a long time, and the hibiscus flower, which grows in my country. Movement and culture/roots: two things that have shaped my life and made me who I am. What are some of your goals for the rest of the year. To get through my Pilates certification, which requires an additional 18 weekly hours, and to have the time to go on at least one date! Is there anything else that you’re working on that you care to share? Simultaneously, I’m training to teach Climb & Invert with Climb & Spin Inc., so I can knowledgeably teach my pole fitness students how to flip upside down progressively and safely. New Invert Drills and Climb & Invert classes will be added to my schedule soon! Keep up with Micaela at yogawithmica.com. Teresa Scott and I used to work for the same publishing house, and one thing that always struck me about her was that she seemed so cool, approachable and down-to-Earth. Her energy made a lot of sense to me after I learned about her passion for boxing because, in my mind, it’s hard to break someone’s spirit when they’re grounded in something that they truly enjoy. She has found a way to not only thrive on her passion but use it as a way to inspire other women. For Scott, what started out as a hobby to lose weight and stay in shape has become a business. 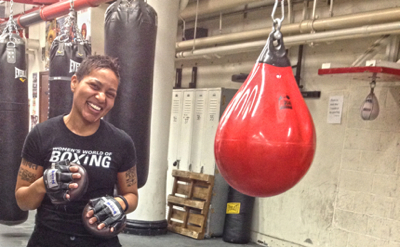 She left her career in publishing to move forward with Women’s World of Boxing and it’s going well. Looking at her physical condition now you’d think she was born boxing but she didn’t start until adulthood, and that is why I felt it was important to share her story. 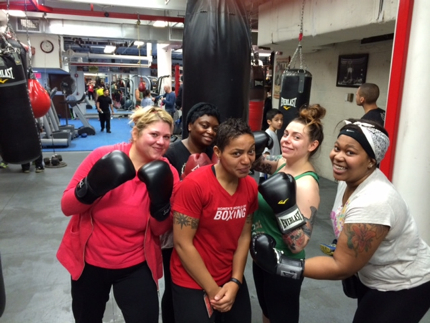 She graciously explains how she got involved in boxing and why she encourages women to give it a try. How did you fall in love with boxing? That is an interesting question! How does anyone fall in love with something or someone and at what point do you realize and accept that it is in fact love? My first recollections of love and boxing are of the way boxing made me feel. I was 215lbs, overweight, over my career and over not feeling passionate about anything. When I started training ten years ago there were very few women in the gym. It was the typical old school, “man’s world” of a boxing gym and just walking in was a challenge on most days. Between the trainers unwillingness to train women and the male clientele uncomfortable training with women, it wasn’t the most welcoming environment. It made training even harder so there was no love there. It was getting through everything that made it hard, overcoming the hard combined with feelings of accomplishment and eagerness to go back and train harder the next day is when I realized I was in love with boxing. At what point did boxing become less about weight loss and more about maintaining it as an everyday lifestyle? Being overweight my entire life, everything was about my weight and size. I was always “healthy” until I wasn’t. I was 30 and my doctor informed me that I had high cholesterol, high blood pressure and was at risk for diabetes and heart disease. I had just started boxing so I figured I would train, weigh in, track my progress and check back in with my doctor in 6 months. The funny part about that tracking process was after training for hours every night at the gym I was too exhausted to track or weigh anything! Boxing requires so much discipline and focus that for the first time my focus was not on my weight or my size. It was on training, what I was learning and discovering all the things that my body was capable of. What’s your diet like these days and why does it work for you? I maintain a low-carb, high protein, gluten free as possible and meatless diet. It works for me because it fuels my body instead of leaving me with feelings of being weighed down. 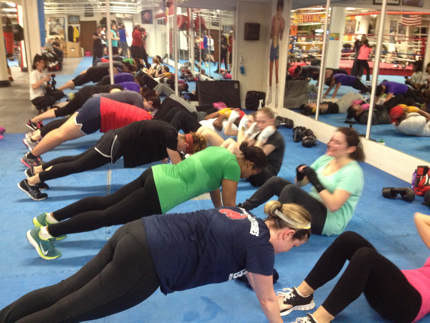 What is Women’s World of Boxing and what lead you to want to share your passion with other women? 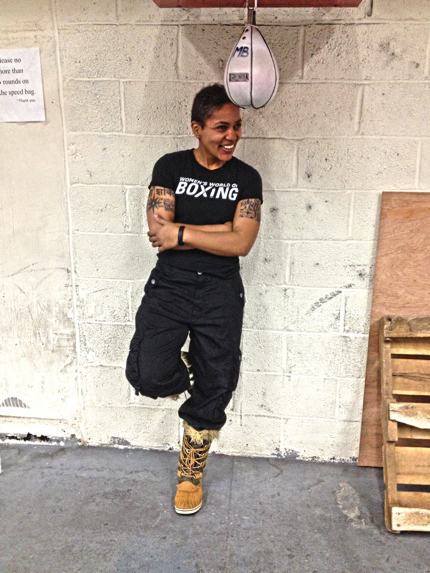 When I started boxing, a week would not go by that one of the guys at the gym would say to me, “this is a man’s world and you have no business here.” I told them I had no interest in being apart or disrupting their world, I simply planned on creating my own which is how I came up with Women’s World of Boxing. I wanted something that didn’t exist. A welcoming, safe environment where young girls and women can come to learn how to box and train hassle-free surrounded by a community of supportive and inspiring women. What do you know now about women and boxing that you didn’t know then? That women follow the sport and probably know more about boxing than the average guy. What are some of the biggest lessons you’ve learned about yourself going from working a nine-five to a full time fitness entrepreneur? I’ve learned the importance of time management, maintaining a balance, connecting and networking with other fitness entrepreneurs, and reaching new prospects. When you work for someone else, even if you hate your job or employer, there is comfort there knowing that as long as you show up and do your job, you will see a paycheck in two weeks. I’ve learned to find comfort in creativity and uncertainty. There is no nine-five when you work for yourself, there is just now and yes. 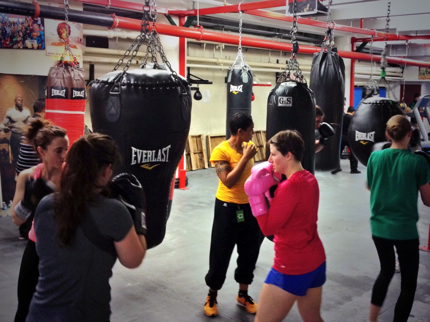 Give me three reasons women should consider boxing. Reason #1: It releases stress. Reason #2: You will apologize less. Reason #3. They will discover strength they never imagined they had. What are your goals and intentions for this year in terms of career and life in general? 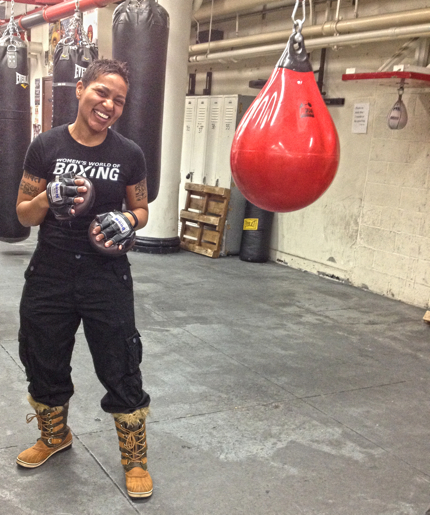 I intend making history opening Women’s World of Boxing independently in 2014 by being the first woman-owned, women-only boxing gym in NYC. I intend on franchising WWB nationwide and manufacturing boxing apparel and gear for women of all sizes. I intend starting a WWB Girl’s Club and summer camp to focus on empowering girls through the sport of boxing, and host related health, fitness and mentoring events. So I guess in terms of both life and career goals, my intention is to share my life/boxing experiences with the hopes of making a difference. 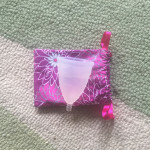 I encourage women to try it. If it’s for you, you will know it and if it isn’t at least you will know that it isn’t. Visit WomensWorldofBoxing.com for more information. I stumbled upon the featured photo (pictured above) in a Facebook group and found it so striking that I couldn’t resist reaching out to find out more about the woman in the image. Her name is Nicci Morris, and she’s a writer, editor, entrepreneur, yogi and new mom who makes it a priority to find daily zen amid bedlam. I asked her to share her tips for practicing yoga successfully, making time for workouts even with a baby, finding peace when life gets hectic, and how she brings foodies together in the name of love. How has fitness played a role in your life? Were you active as a child or did you get more involved in pursuing your well-being as an adult? I was relatively active as a child. I ran track and played softball for a little while. I wish I had been more active though. I was more into writing and reading. As I got older, I became more interested in fitness and health. I earned my certification as a fitness trainer in my early 20s. I plan to do so again this year. Yoga instructor certification is also on my to-do list. I fell in love with yoga in 2010 and have been delving more into my practice since then. I tried Kemetic yoga for the first time last year and I definitely felt a deep mind-body connection. I plan to explore that deeper. On a good day, I eat 100 percent plant-based. Complete veganism is my goal. I was raised eating meat so it’s a work in progress. But for ethical and health reasons, my goal is to get to the point where I don’t consume any animal products. Since I had my daughter, Amina, last August it is more important to me than ever that I am as health-conscious as possible. I want to be in great health for her and I also want to give her a good, clean start with plant-based nutrition. You’re big on morning smoothies. What are some of your favorites and why do you start your day like this? I love smoothies. I am an early-riser, but I am so not a breakfast person. However I look forward to my morning smoothies. I keep them to a ratio of 50 percent greens, 30-40 percent fruit and the rest is nuts, chia seeds, hemp hearts, oats etc… for fiber, protein and healthy fats. Add water to get the consistency you desire and blend away. They’re filling and I’m energized for hours afterward. 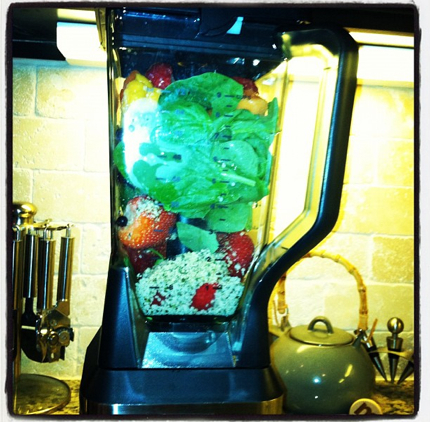 I can’t get enough of my NutriBullet. Do you have any food weaknesses? If so, how do you find balance between binging and exercising self-control? For me, it’s not so much about managing the type of food as it is about managing my emotions. I am an emotional eater/non-eater. When I have allowed my stress to get the better of me, I have struggled with over- or under-eating. Neither are the answer, so I work to keep that in check and have more patience with myself and others on this journey called life. How have you been able to balance new motherhood with a zen lifestyle, work and keeping up with your practice? Let me start by saying it is not easy. But I believe a happy mommy leads to a happy baby. I have to take great care of myself to take great care of my daughter. I have had to swap frequent 90-minute hot sessions for shorter unheated sessions at a studio closer to my home, on demand via cable and poses and stretches when and where I can. I was not thin to begin with, so I only gained about 20 pounds during my pregnancy. I lost most of that within the first couple weeks after I had her. But I found that everything had changed. I’m still figuring out this post-baby body because I am exclusively breastfeeding and plan to for at least another six months. Just drinking enough water and eating the right foods requires serious planning. There was an incident late last year when I allowed myself to become extremely upset. I actually felt the adrenaline and cortisol kick in and I felt the negativity of that situation move through me. The next few days I noticed a dramatic decrease in my milk production. I know it was a direct result of that stressful situation. That hit home with me and I’m so grateful for that life lesson. Never again will I allow stress – especially centered around something over which I have no control – to affect my health. Is there an ideal body type for practicing yoga? I’ve been the largest woman in the studio and I’ve been the smallest woman in the studio. I’ve been the only black woman in the room and I’ve been in classes where nearly everybody was black. None of that truly matters in life and it certainly doesn’t matter in yoga. Yoga is about union with your divine self. Everybody can benefit from this ancient practice. If we all did nothing more than center ourselves and remember everything can be accomplished as long as you have time and breath, the world would be a much better place. What advice do you have for potential yoga newbies? My advice to the newbies is to breathe deep and focus on their journey. Remember that the person in the front of the class who moves from tree to toe stand with such ease and grace was not always able to do so. Focus on your practice and your connection with your divine self. If you do that on a consistent basis, the rest will come. But I also have advice for the instructors and the people who have been practicing for years. Be kind. Be patient. Make your studio/classes inviting and create an environment that allows new students to peel back the emotional and physical layers as they begin their practice. While there might be books/videos that help people, I think the soul-to-soul connections work best. I also believe we benefit from having an instructor. There have been times when I was ready to go deeper into a pose, but for whatever reason I didn’t realize it. A good instructor can help you make adjustments and also push you to take your practice to another level when you don’t even realize you can. If you run across a less-that-ideal instructor (I have and it wasn’t pretty! ), don’t let that sour you. Try a different class or a different studio. You will find the right place for you. Explain the concept behind your site, LoveandFood.com. 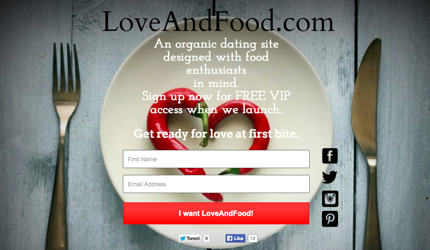 But seriously, I think of LoveAndFood.com as the modern-day twist on meeting the love of your life in the grocery store. In addition to the ability to search, flirt and chat with other members, we will also have meetups in larger markets across the country. It will be a great way to meet other singles and to support non-chain restaurants. What are your goals and intentions for 2014? My goals are to love well, eat well and live well. The only thing that matters is the thing that doesn’t change. The only thing that doesn’t change is love. 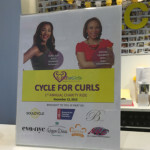 Visit www.niccimorris.com for more information about this fierce yoganista. Check out last week’s Grunty Crush, Chrissy K. Fit. I met Christine aka Chrissy K. when I lived in Chicago. The AFFA and SCW-certified group fitness instructor taught many of my pole dancing classes at Flirty Girl Fitness. She also teaches strengthening classes, sculpting, cardio dance, interval training with plyometrics, and fusion classes at various fitness facilities around the city. Chrissy is the type of instructor that you’d want to be friends with. She’s knowledgeable, fun, friendly, supportive, and all of the above is why I continued taking her pole dancing classes and occasionally stretch classes too. Her newest endeavor is “Chrissy K. Fit,” a series of YouTube videos where she provides quick workouts that can be done while watching TV. Get this: It was inspired by Scandal. I caught up with her to chat about how she stays positive, in shape and motivated to spread joy through an active and healthy life. She’s fly, down-to-Earth, wise and snatched! Get into her! What inspired the launch of your YouTube page, Chrissy K. Fit? Every Thursday night I would be conducting classes at the gym and the numbers were always lower than on other days I taught. I remember saying to myself, “I wonder if they’re all at home watching Scandal. “ I then thought, well if they’re going to be at home at least they could work out on the commercial breaks, and that’s how Chrissy K Fit on YouTube got started. With every Quick Fit Tip segment I try to add a skit of humor attached along with helpful fitness information. I like to add the laughter because getting fit and exercising should be fun and something you look forward to. How did you get involved in living such an active lifestyle? I have always been athletic. I was a major tomboy growing up, and was involved in many sports. I ran track in high school, was a part of the cheer leading team and have been a professionally trained dancer since the age of 17. I was a dance instructor for various different schools in the city of Chicago when one day, a friend of mine needed a substitute for a class she was teaching at a fitness facility. She called me in, I taught the class and was hired that day. I became exposed to a different side to fitness and have been in love with health and fitness ever since. That was over eight years ago. You teach many types of fitness activities but how did you get into pole dancing? It’s funny you asked. I had no desire what so ever to teach pole dancing. I just simply wasn’t interested. The gym that I worked at needed more pole instructors that knew how to dance, so they asked me to learn. When I started learning I was shocked at how incredibly strong and fit you had to be to execute some of those gravity-defying moves. With my natural competitive nature, I began to train hard just to prove to myself that this was something that I could do. About 80% of the time I eat clean. Fresh fruits and veggies lean meats and protein; I don’t eat pork and very little red meat. I drink water all the time. The other 20% I have my carbs, sweets, etc and even then there are good carbs and dark chocolate. Do you have any food weaknesses? Is there any particular thing that you absolutely have to eat, even if it’s bad for you? Yes, my weakness is carbs. I love breads, pastas, doughnuts you name it. I try to eat those things in moderation and substitute pastas with spaghetti squash, and breads with nuts like, cashews or pistachios. All things in moderation! I believe in having self-control over daily urges. Get a hold of your self [laughs]. But when I do from time to time give into those urges you better believe I hit the gym extra hard that week! In terms of getting a fit body is it more important to workout or to watch what you eat? They go hand in hand. It is 100% important to work out consistently and 100% important to eat clean consistently to get and maintain a fit body. You can’t have one with out the other. Granted some people are naturally fit, but for the average person they must do both. In terms of mental wellbeing, you’re very friendly, cheerful and peppy. What keeps you in a happy head space? I received great advice from an older woman a long time ago. She seemed very much at peace and content. I asked her the same question and she told me to not let anyone or anything get me so upset that I couldn’t function or live my life. Ever since hearing that I applied that advice to my life and over all don’t take things to seriously. It doesn’t mean I don’t have to deal with things, but I refuse to let it dictate my own personal happiness. Plus I do things that make me happy and surround myself with positive forward thinking people. How do you take care of yourself whenever you feel sad or doubtful? I address those feelings and allow myself to feel them, after about no more then an hour I say “ok time to move on” and I begin to think of solutions and answers as to why I feel that way and ways to pick myself up. It’s not fair to your self to ignore your emotions, but you also have to come up with a healthy solution to pick yourself back up. What advice would you give people who want to start a fitness journey but may be apprehensive? My advice would be to simply just do it. I would tell them that I met so many wonderful people and made great friendships along the way when I just went for it. No matter what is holding you back size, motivation, time, it’s all an excuse and you will be so proud and happy that you got started. You can do it! Fun Facts About Chrissy K.
1. Starting on March 7, 2014 and every Friday afterwards she is teaching a 5p.m Cardio Dance class with current hip hop and billboard music and a 6p.m class called “Late Night” Chair Fit at a gym called Vie Custom Fitness. The first class is free at Vie, and anyone can register at Vie Custom Fitness. 2. She has partnered up with a company called Unicity that offers natural products that help lower cholesterol, with controlling blood sugar levels and Diabetes, and Natural Energy and Natural Focus Products. She takes these products and speaks highly of them. Two of her favorites are the Unicity Matcha for natural energy, and Unicity Matcha for Focus. Find out more at chrissykfit.myunicity.com. 3. Chrissy’s favorite get ripped foods are lean meats (she eats no pork and very little red meat), protein shakes with flax, veggies, all natural oatmeal, very little sugar, lots of water, eggs and nuts. *Want to be a Grunty Girl? Send an email to Starr@gruntsandglam.com explaining why you’re grunty in a few sentences, along with your social media networks for consideration. There are no other rules. You can be short, tall, skinny, thick, black, blue, wide as all outside, a newbie on a new journey or as advanced as an Olympic athlete, as long as you’re an inspiration. You can also nominate friends.